Computers, science fiction, cat watching, stuff related to space travel. Dr Who hasn't added any friends yet. #65163 Can a Netduino model 1 power external logic directly? As the topic subject asks, "Can a Netduino model 1 power external logic directly?". I've a new design taking shape, and whilst I know that when running a device via USB to program it, the answer would be "No. ",but what happens afterwards? This would be ordinary TTL stuff, circa 1980. Incidentally I've successfully mounted it inside a "Project Enclosure kit" from Radio Shack. Plus a prototyping shield as designed by Makershed. New project time here. Right now I have running a Netduino using an edited form of one of my PAL driver programs to talk to an SN7437 wired to send the output of the first gate to go to the second's first input. There's also a red LED attached to first's output. The one for second is connected to a SSR who's activating the 24V coil in the counter. I'm keeping the format that I found worked for the earlier efforts, however it's the driving circuits that I'm stuck on. That one I described is the first one I tried. So naturally it worked. Oddly enough the circuit refused to work with a Basic Stamp2 device. #64966 I broke the forum at this location, please HELP!!! Simple really, report it to the webmaster. That person will have to repair the damage caused by the system. You are not at fault here. After several months, trying this again :-). Reset my mini by applying 5v to the gold erase pad, attempted to connect via SAM-BA and it says "no valid processor found". Well yes. When uploading fresh firmware to the little guy, the user needs to connect to the RS232 points at RS232 levels. The FTDI breakout produces TTL: or CMOS compatible output levels. So you'd need USB to RS232 adapter to do that. I normally use one for the Basic Stamp gang to make it work since its within four solar diameters of the specifications in the FTDI datasheet for just such a design. It also expects 5v at the positive voltage connection when working. The TTL management connections are fine for sending it the firmware for TTL stuff although you might need to do the same thing as you just did for the regular fresh firmware for it. I expect Chris will chime in with appropriate things as soon as he's around. My latest accomplishment, is to have a Netduino 1, wearing a BOE Shield from Parallax poking an installed part, blinking LEDs, and then sending the output to a BS2. That Parallax BS2 also mounted on its own BOE (Board of Ed, so named because they were frequently used in schools until fairly recently.) 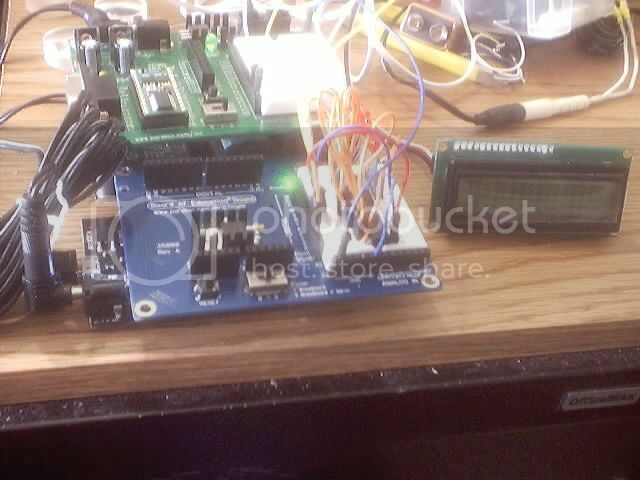 is receiving the data and sending to an attached LCD display. I�ve run into a wall attempting to upgrade my Netduino Mini from NetMF 4.1 to 4.2. The theory�s great, but things seem to come unstuck for me when I try to use SAM-BA. Completely reset the Mini with 5v to the tiny reset pad for ~1 second. My laptop does not have native serial RS232 so I�ve set up for the bootloader flash with a USB->RS232 FTDI breakout board. Board RX connected to Mini TX. Board TX connected to Mini RX. Board Gnd connected to Mini Gnd. My setup looks pin perfect to Frode�s. There�s a flurry of TX/RX traffic on the FTDI LEDs and then SAM-BA returns a dialog titled �Invalid Chip ID�. I get the same dialog when any AT91 device is selected in step 5. Thinking that my Mini could be dead, I lifted it from the ZIF socket and tried again � checking the RX/TX LEDs. This time there was no RX traffic, which I�ve interpreted as meaning the Mini is alive and can respond to SAM-BA when I click the Connect button. I�ve googled until Chrome shows every relevant link in purple (been there, read that!).. so now I�m kinda stuck. I�d be stoked to hear anyone�s wisdom on this topic. Thanks in advance! First things first. Did you follow everything in that thread? I bumped, and hard as well, into the same issue with mine. I found that it would need to be power-cycled and that means to turn the board off, wait a few moments, and turn it back on. Then follow the deployment steps. Incidentally the Wiki describes exactly how the tool is supposed to be configured, also that you're supposed to connect to it, the Mini via an RS232 connection. Since most modern systems do not have them that means we need to use proper Serial from USB adapters, and oddly enough FTDI makes the proper chip for that. You then need an adapter who embodies that design. Oddly enough a company in California (USA) makes an adapter for that purpose, normally useful for programming their devices who still use Serial as a deployment method. Depending on where you are based, a store front firm named Micro Center sells the first entry directly. They are also recognized sellers for NetDuino devices which I find supportive. They also sell Parallax items and even those dratted things which our hosts based the shape of the others on. The reason why I'm pushing the use of those items is that the adapter you chose, which is a breakout board probably designed by Sparkfun, translates the signals into TTL levels, a second chip, which is a MAX232 chip translates them into those idiotic RS232 voltage levels. Frode's idea may have used one that they make which coincidentally is functionally equivalent to the two I name, (The FTDI company that is.) The SPFE breakout board which I use here also, is just the front end, the MAX232 does the heavy lifting and the final voltage translation. So in conclusion to completely solve your problems you need to be using either of those two adapters, and then a DB9 connector connected to it, and the appropriate pins connected to the Mini, which is an easy summary. Incidentally Chris you can pay me Tuesday for the reply today. And Microsoft did not drop the Framework. They just redid their site and created a new series of releases for later releases of VS.
Mouser. Also Digi-Key. And then Jameco. Be warned Mouser loves hobbyists. Digi-Key doesn't mind them. And Jameco is still trying to figure them out. In the case of Jameco, should you decide to buy something from them, be prepared to buy a lot of items you might need. Even if that need is months to years later.